In times of moral confusion, I turn to my collection of a gajillion western paperbacks from the 1940s and 1950s*. Their bold colors and bolder titles (such as Action by Night, Gunsmoke Justice, Dig the Spurs Deep) bring me back to my center. Good/bad. Right/wrong. Yes/no. Gunlock, by Wayne D. Overholser, has a remarkably prosaic voice, given the usual purple prose of these western romances-for-men. When I got my eyes on Dillingham, he was bending over, reaching for his .45 with his left hand. I shot him. He fell, and I fired again. Using the “I” of first person was also unusual; most westerns rely on the reader seeing the hero as god–the “he” of third person setting the hero apart from common mortals. A reader could be like writer Ernest Haycox’s moody protagonist, but not be him. 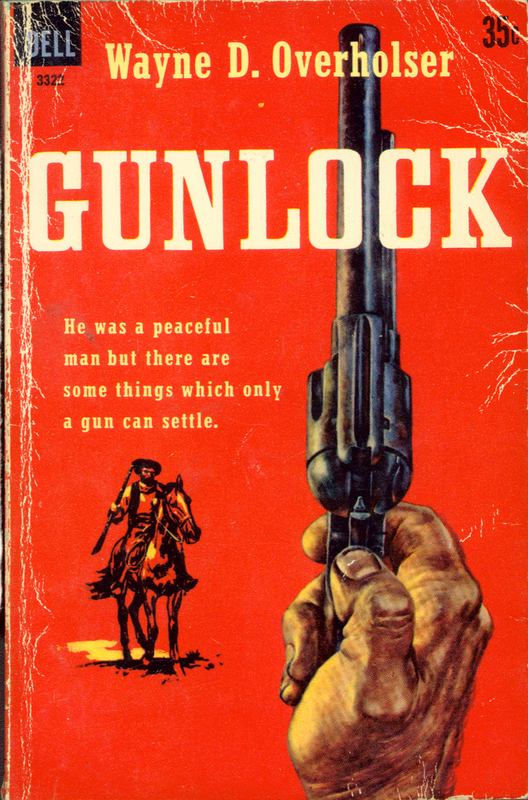 In Gunlock, the reader is the vengeance-driven hero-next-door, who is about as matter-of-fact as a cab driver. *** Which pulls me right away to the incomparable Taxi Driver, about a young man-next-door who, driven by vengeance (and driving a cab), gives a rather nihilistic view of the self-aware and moral individual and his/her place in the world. In 1956 the protagonist of Gunlock instinctively does what’s right (shooting from the hip! ), cleaving his way through good and bad, straightforward and twisted, until he gets vengeance on the bad guys, gets a spread, and gets the girl. Travis Bickle of Martin Scorsese’s film, twenty years later, also does what he does instinctively, getting vengeance but not the girl–and he becomes the hero he sees himself to be. The viewer who does not identify with him, or who is plain confused about whether this is a good guy or a bad guy, is then treated to the slickest and most chilling foreshadowing of more bloody vengeance on the horizon–ever. He was a peaceful man but there were some things which only a gun can settle. 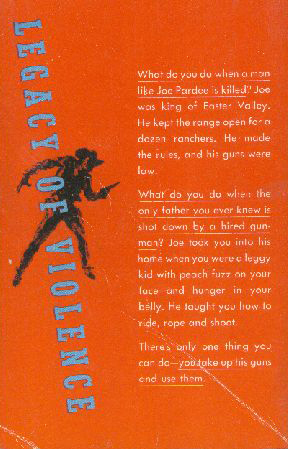 The back cover adds a cautionary note, if one cares to read a yellow flag in it: LEGACY OF VIOLENCE, with a jarring color contrast. But then, who ever pays attention to the back cover? You…you talkin’ to me? You talkin’ to me? Well I’m the only one here. You talking to me? **Case in point. Across-the-street car service drivers on the whoop-up trail until 5 in the morning. Just thinking about the men, women, and children trying to enjoy their Friday night sleep (like me) gets me ticked. A cowboy of any gender would shout out the window, call the establishment, whatever. I tried to go back to sleep. But I guess I’m not the only non-cowboy on my city block, as no one else drilled them in any fashion. **** I wonder if the Taxi Driver analogy has come from a sleepless night due to livery drivers? One can say that the taxi drivers are the mavericks, while the livery cab drivers are more like the cowboy organizations. Well, whoever they are, they are doing the equivalent of shooting up the town. once again I am shocked into recognizing the cowboy in my life…. Now I know there are Jewish cowboys because I read about one in my OY/JOY daily calendar but it’s not just that – it’s suddenly seeing the nuance of cultural in my world which has always felt more social justice radical artist. I mean really can you imagine van gogh or beethoven with a holster? although now I recall that New Yorker cover of the two famous artists facing each other in a high noon moment, paint brushes in hand. Regardless, I’m relieved cowboy land is not my main culture because otherwise I would be down there guns locked and loaded at 5am. ps check your mailbox tomorrow. The foe has become a target, a quick Impressionist sketch. You ARE the hero, white-knuckling the hammer back on a six-shooter. The excellent film adaptation of Allister MacLean’s book. Jewish cowboys would be a whole other post. Even Deadwood relegated a Jewish man to the general store. What, they couldn’t sling guns with the Protestants? The over is purely the magic of Robert Stanley, and his art directors at the time. As the hand is almost assuredly Stanley’s that adds another level to identifying. An Errol Flynn western film collection came out recently, trying to tout him as more of an American cowboy star than John Wayne. Um, no. Too foppish. But how was he in Dodge City? How did they explain his elegant carriage and diction? I’m reminded of how directors tried to explain Jean-Claude van Damme’s accent in his many movies. French, no. Eastern European, no, American living abroad! Haven’t read Allister M.’s book. I’ll look for it. have to read the rest of the Annie Proulx collection. If I dare. Might have made a good Bat Masterson……..
Sukiyaki Western Django is supposed to be good. I’m behind on my western viewing, though. Haven’t seen it yet.